Salon De Legge - Opole - Poland has enjoyed the distinction of being voted by Goldwell as one of the top 5 hair salons in Poland. The salon launches hair collections every year at the Polish National Hair Show, followed with photo shoots and press releases with publications like Passion, Clips, Salon and other magazines throughout the world. De Legge European Salon in Asheville brings an international flair to North Carolina. Here we see three views and two style variations of a single base cut. 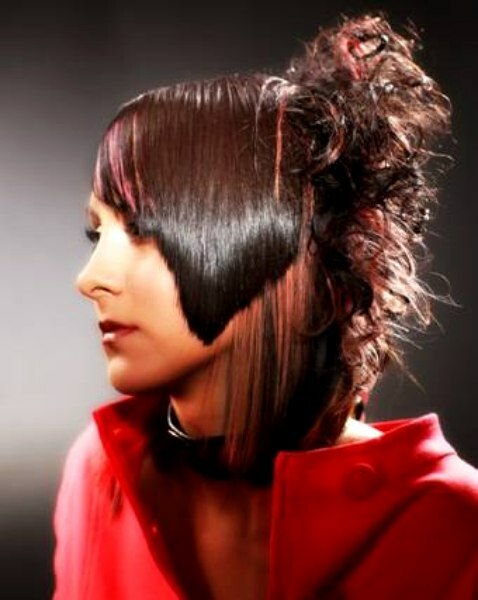 The cut itself is shoulder-length with an angled cut line at the bottom edge which is textured to soften and give a gentle curve to the line. The top section is cut into an overlapping, extended fringe with steep angles and geometric shaping. 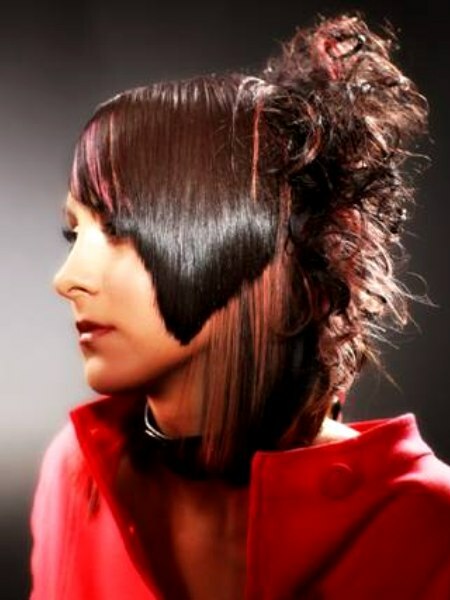 These lines and angles are enhanced and dramatized by the use of targeted coloring techniques to create mirroring lines to emphasize and compliment the cutting lines of the hairstyle. In the photos below we see a razor-cut style that features a chin-length fringe and targeted blonde color to accentuate the fringe area. The shoulder-length hair is further highlighted by panels of blonde color on the outer layers of the hair which create a visually interesting effect as the hair moves.